R. McClure and other Arctic Voyagers. Compiled by J Hugh Johnson FRGS.". The polar view from the north shows the limits of knowledge of this region in 1856. A.Fullarton & Co. Edinburgh London & Dublin.". Plate 3 from the 1897 Century Atlas. Polar arctic countries ocean ice pole historical map north. The German title of the page is: Nord-Polarländer This original historical print from the year 1888 was published by Bibliographisches Institut Leipzig in Germany as part of an encyclopedia. The Roman Empire at its Fullest Extent. 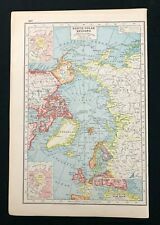 A 1912 Tri-Fold Map Print. The Nature of Prints & Engravings : It was not until the 20th century that prints were commonly produced for the print itself. Prior to this, virtually all prints (and engravings) were produced as illustrations to be included in a manuscript, book, newspaper, or pamphlet. Published by Eaton & Mains in. The coverage area is centered on the North Pole and includes notations on discoveries made by various explorers, including Amundsen, Ross, Schmidt, Wellman, Nansen, Byrd, and Peary. The map defines the areas of permanent polar ice and the northern limits of wooded country. 1829 Antique Map///POLAR REGIONS INCLUDING BRITISH NORTH AMERICA, ETC. Date - 1829. or send resale number. Published by Thomas Tegg. Polar arctic greenland pole iceland alaska. The German title of the page is: Karte der Nordpolarländer This original historical print from the year 1894 was published by F. A. Brockhaus in Germany as part of an encyclopedia. Nice colored map of North Polar Region. Pub/1895 in The People's Cyclopedia. 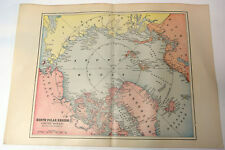 Up for sale is a great antique map of The North Polar Region (Arctic Ocean). Map was published in 1895 in The People's Cyclopedia of Universal Knowledge. Published by Hunt & Eaton, NY and San Francisco. The map was published by George Franklin Cram of Chicago in 1911. Large Map of the North Pole Region From the US Hydrographic Office Chart 86, USN Pac Survey Expedition in 1855: Comdr John Rodgers. Map is mounted on cloth for folding. Map of the North Pole Region From the US Hydrographic Office Chart 86, USN Pac Survey Expedition in 1855. Description: This lithographic print originates from: 'Nouveau Larousse Illustre en sept volumes. ', Directeur Claude Auge, Paris, published 1897-1904, with a supplement addedin 1907. The Nouveau Larousse illustre (New Larousse Illustrated) was an illustrated French language encyclopedia published by Larousse between 1897-1904, in 7 volumes and a supplement. It was essentially a scaled-down version of the 'Grand dictionnaire universel du XIXe siecle.' (Great universal dictionary of the 19th century) of Pierre Larousse, but updated and written in a more neutral, scientific style under the editorship of Claude Auge. Artists and Engravers: Made by 'Pierre Larousse' after an anonymous artist. Pierre Larousse (1817-1875). From 1638 to 1662, and then beyond Janszoon’s death until 1681, many more editions appeared in a total of five languages. 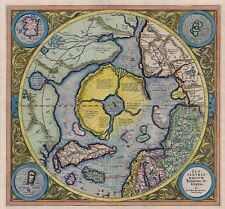 Map of the Arctic from Janszoon’s “Atlas Novus” (1638). Print Date: 1979. in the German Democratic Republic by Haack Gotha. The coverage area is centered on the North Pole and includes notations on discoveries made by various explorers, including Amundsen, Ross, Schmidt, Wellman, Nansen, Byrd, and Peary. The map locates glaciers, ocean currents, and water depths, and it shows airports, early warning lines, major cities, and the southern limits of drift ice. The other side has a partial map. Overall fine. Typical margin toning. You will receive this map. Zoom to inspect. Includes Hudson (1611), Baffin (1816), Franklin (1845-474), Kane (1853-58), DeLong (1879-82), Greely (1881-84), Nansen (1888-96) & Peary (1908-09) and others. See upper corner legend. North Pole & Arctic Region Explorations. Antique, Original 1890s Map. North Polar Region. 15" x 10 1/2" overall. 1880 Census County Populations adjusted to 1882 are Listed on Reverse. Fine Map for the Collector or Historian. Makes an Imaginative & Creative Gift. Shows Adventurer's Progress. Original 1882 Mapof. Date - 1911. Good Luck! Source - George Crams Unrivaled Atlas of the World, New Census Edition. Size - about 11x15". 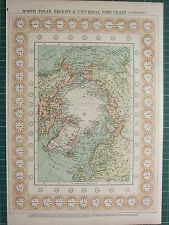 Fine antique 1898 2 sheet map, titled North Polar Regions. The map is very detailed, with fine period color lithography, fascinating period details, much has changed. The size of the map is 14" by 23". 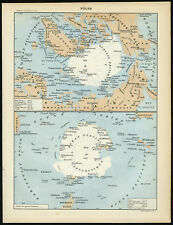 Very fine antique 1898 color lithographed 2 sheet map, titled Rand, McNally & Co.'s New 14 x 21 Map of North Polar Regions. Many interesting details, and much has changed. The size of the map is 14" by 21". Septentrionalium Terrarum. North Pole / Arctic Projection. This Reproduction Antique Map features Reproduction Map. Print sizes are approximate, and may include a white border around the print, which will vary in size depending upon the originals proportions. 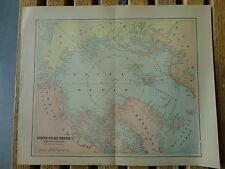 Antique print, lithograph, map "NORTH POLE & LANDS AROUND NORTH POLE ". Circa 1908. The other side - clear. Image size - 26,8 x 21,7 cm. Condition - Excellent condition. Map ~ NORTH POLAR REGION with NANSEN'S ROUTE to POLE Mounted ~ c1890 10" x 8"
Original map, not a copy, from an educational atlas published by George Gill and Sons round about 1890 to 1895. Other material on the reverse side does not impinge to the side illustrated and is camouflaged by the mounting process. 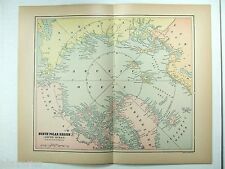 1874 ca LARGE ANTIQUE MAP- FULLARTON - THE ARCTIC REGIONS, WELLINGTON CHANNEL, ICEBERGS, SEALS,WALRUS. From: The Royal Illustrated Atlas, Of Modern Geography, by Archibald Fullarton, London & Edinburgh, undated circa 1874. It has been removed from the Harmsworth's New Atlas which was published in 1920, just a few years after the end of World War 1. Original map, not a copy, created and published by Alexander Gross and Geographica between 1919 and 1920. Note we do not dismantle collectable books, only publications in poor condition and unlikely to be cherished for their own sake. This is a genuine antique from the end of the Victorian era. BACON'S POPULAR ATLAS of the WORLD 1900. A beautiful map on fine quality paper from If you like the item, but do not like the price. QUICK SALE AT A FAIR PRICE. An original, antique, copper-engraved map of the Arctic region. Condition report: Very good condition; light age toning; French text verso. Clear image printed on hand laid paper. Very occasional, faint marginal staining / handling marks. A beautiful VICTORIAN map on fine quality paper rescued from a disbound book atlas BACON'S NEW GENERAL ATLAS of the WORLD 1908. There will be unrelated text on the reverse of the print. 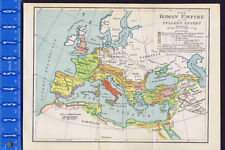 This is an original antique map taken from a disbound copy ofBacon's Universal Atlas of the World published c.1898. A Really lovely unique piece, it is an original antique map not a modern reproduction so is over 120 years old! Provenance: 'Adolf Stieler's Hand Atlas uber Alle Theile der Erde und Uber das Weltgebaude', 1886 edition. Date: 1886. Text in German. 1896 LARGE VICTORIAN MAP NORTH POLAR REGIONS. LARGE DOUBLE PAGE MAP WITH FOLD DOWN THE CENTRE. This is an authentic print, published at the date stated above. It is not a modern copy. The reverse side of the map is blank other than title detail. An antique map on quality paper printed in 1919. This is a particularly large format map. Because of its large size, it has many. for The Victory Atlas of The World. A beautiful antique print on fine quality paper EXCELLENT condition and rescued from a disbound atlas BACON'S POPULAR ATLAS of the WORLD. (Bacon's Popular Atlas of the World). THIS VICTORIAN PRINT IS AN ORIGINAL. Double sided, there is another map on the reverse side. 'North Polar regions'. Title of map:'North Polar regions'. Antique colour atlas map, 1900. DATE PRINTED: 1900. The image below shows an enlarged cross section from the centre of the map to show the level of printed detail. A beautiful antique map on fine quality paper VERY GOOD condition and rescued from a disbound atlas Free from any text on the reverse. Map produced & printed by THIS ATTRACTIVE MAP IS AN ORIGINAL. A beautiful antique print on fine quality paper EXCELLENT condition and rescued from a disbound atlas BACON'S NEW GENERAL ATLAS of the WORLD. (Bacon's NEW GENERAL ATLAS). Map produced & printed by. 1920 LARGE MAP ~ NORTH POLAR REGIONS ~ 23 INCHES x 18"
Full Title: North Polar regions., a double page authentic and original colour map reduced from national surveys and the special surveys of travellers and explorers ~ The Edinburgh Geographical Institute. (Bacon's Popular Atlas of the World 1912). A beautiful antique map on fine quality paper EXCELLENT condition and rescued from a disbound atlas Map produced & printed by THIS ATTRACTIVE MAP IS AN ORIGINAL. Published in 1921. AN ORIGINAL MAP OVER 95 YEARS OLD. MAP North Pole and Unexplored Regions ARCTIC CIRCLE. It shows the North Pole with unexplored region. Bering Straight - Arctic Ocean - Sea of Okhotsk (part) - Siberia - Stanovoi Mountains - Russia - Novaya Zemlya - Barents Sea - Lapland - Norway, Sweden etc - Ural Mountains - Iceland - Greenland - Newfoundland - Baffin Island and Bay - Canada - Alaska - etc. Original antique map by G W Bacon. Single flat page, no folds. Provenance: The Royal Atlas of Modern Geography, by Alexander Keith Johnston, New Edition published by W & A K Johnston, Edinburgh and London, 1885. Large, attractive, highly detailed and colourful map. Single sided, ie there is nothing on the reverse side other than page numbers and title information. Large coloured map. OVER 110 YEARS OLD. Folded as issued, folds can be seen clearly on the picture provided.